The Oaks Academys philosophy is that all children can achieve educational success if provided the right options. We believe in a personalized continuous progress program. We must discover where each student is functioning through the use of appropriate assessment and benchmarking tools before we can lead them effectively forward. We also believe that we can help each student at the Oaks Academy become able to recognize and positively manage their own emotions through individualized education interventions that would include tutoring, mentoring, specialized learning programs, and social skill development activities. 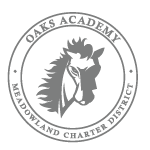 It will be out goal to assist each student at the Oaks Academy increase their decision making skills, interact positively with peers and adults, and practice self-discipline.